It seems like when there's a revolution in the bathroom industry, it originates in Japan. This was the case recently at a recent exhibition at the Ginza shopping district in Tokyo. According to NewsNet5.com, Swarovski has put a custom-made toilet on display festooned with 72,000 crystals that took more than a month to complete. The toilet is being displayed at the Lixil showroom as a means of promoting Swarovski crystals and showcasing unrivaled decorative potential in the most unlikely of places. 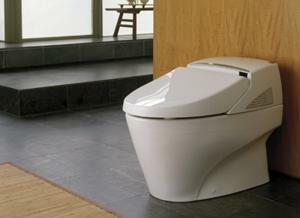 While the piece is not expected to go on sale, it has been valued at $128,000 and is considered one of the most expensive toilets ever made. "Much has happened in Japan this year, and as we approach the end of the year we're displaying this item, hoping that we will carry on and make the coming year one that shines brilliantly," Kazuo Summiya, manager of the Lixil showroom, told the news source. A crystal toilet is a luxury that few could afford to incorporate, but if you did have a chance to use this stunning throne, what kind of decorative scheme would you use with it?